The Archive service is for CDs which have been deleted and where the musical content is not otherwise available. This service offers a production-quality CDR with printed label, inlay (tray) card and, at the minimum, a 2pp booklet (including cover artwork and complete track listing), packaged in a normal jewel case. In many instances we will provide complete printed booklets, but please note that this is not always the case. Pricing is £13.99 per CD, regardless of the original sale price of the disc(s). The impression is often given that Mozart, uniquely among the great classical composers, was able to compose easily and quickly without the aid of sketches. True, we have examples of astonishing facility: he is said to have written the overture to Don Giovanni in a single night, and the whole of La Clemenza di Tito in eighteen days. 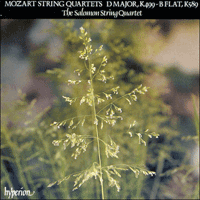 But his mature string quartets certainly cost him a great deal of effort. He was occupied on and off for nearly three years with the six quartets he published as Opus 10 in 1785, and in the dedication to Joseph Haydn he wrote that they were the fruit of a ‘long and very laborious effort’. It was no exaggeration, for an abnormal number of sketches and revisions survive for them; Mozart evidently found it difficult to come to terms with Haydn’s mature string quartet style, as exemplified most recently by the Opus 33 quartets of 1781. Mozart did not complete another set of quartets after the six dedicated to Haydn, but he did not neglect the medium. And there is evidence that it continued to give him trouble. His next quartet was the single one in D major known to us as the ‘Hoffmeister’, K499, so called because it was issued in Vienna in 1786 by the publisher Franz Anton Hoffmeister (1754–1812). Hoffmeister was also a composer and had started a publishing firm two years before to print his own music; he soon expanded the business to include orchestral works and sets of chamber music by his contemporaries, including Haydn, Vanhal, Albrechtsberger and Mozart. Mozart and Hoffmeister were friends and fellow-Freemasons. Their dealings apparently began in the autumn of 1785, when Hoffmeister published Mozart’s G minor Piano Quartet, K478. Mozart based one of the movements of his Flute Quartet in A major, K298, written sometime in 1786/7, on a song by Hoffmeister. An advertisement survives for the ‘Hoffmeister’ Quartet in which the publisher wrote that it was written ‘with that fire of the imagination and that correctness which long since won for Herr M. the reputation of one of the best composers in Germany’. He added that even the Minuet was ‘composed with an ingenuity (being interwoven with canonic imitations) that one not infrequently finds wanting in other such compositions’. The ‘ingenuity’ that Hoffmeister responded to was the ability, demonstrated to a high degree in Haydn’s Opus 33, to combine the two idioms of the contemporary string quartet: the light, divertimento-like quality of, say, Mozart’s own early works in the form, and the serious, contrapuntal tradition of the mainstream Viennese quartet, exemplified by works by Monn, Albrechtsberger and Gassmann. In the new quartet style the melodies are supported not just by harmony, but by accompanying motifs that have their own role to play in the musical argument; it was a civilised discourse between equals, rather than a monologue or a four-way dispute. The same quality is also found, though in a more relaxed form, in the three ‘Prussian’ quartets, K575 in D, K589 in B flat, and K590 in F, Mozart’s last works in the medium. They were written in 1789/90 as the result of a commission from the King of Prussia, Frederick II, obtained during the composer’s visit to north Germany in the spring of 1789. Mozart evidently intended a set of six quartets, and hoped that they would solve his financial problems, but by May 1790 he was complaining that worry over his debts had prevented him from finishing them, and in a letter to his creditor Michael Puchberg the next month he admitted that he had ‘now been forced to give away my quartets (that exhausting labour) for a mere song, simply in order to have cash in hand to meet my present difficulties’. The published edition of the three completed quartets, issued by Artaria shortly after Mozart’s death, contains no reference to the Prussian king and his commission. It used to be thought that Mozart, eager to get the quartets started, based parts of them on sketches of uncompleted works from the early 1770s, the period of his Italian journeys and his first spate of quartet-writing. The argument has now been disproved, but many critics have noticed that the three works have a relaxed, charming character that seems to hark back to Mozart’s early ‘Italian’ quartets; the mood, set by his recurring use of the tempo Allegretto, is certainly far removed from the pithy seriousness of the set dedicated to Haydn. The explanation seems to lie in the special terms of Frederick William’s commission. The Prussian king was a keen amateur cellist, and collected chamber music with prominent cello parts. In 1786, the year of his accession, he obtained quartets of this sort from Pleyel, and engaged Boccherini—who had developed the string quintet with two cellos—as his chamber composer. The next year Frederick William commissioned a set of quartets from Haydn, his Opus 50. Haydn, as we might expect, did not respond simply by giving the cello concerto-like passages, for that would have fatally loosened his spare, concentrated musical architecture. Instead, he brought the cello into the musical argument by using the sort of motivic, semi-contrapuntal writing that he had just developed for his ‘Seven Last Words’; he made its quartet version about the time he began Opus 50. By 1789, however, Mozart had taken what he needed from Haydn’s quartet style, and was ready to move in a different direction. The royal cellist is indulged in expansive solos that take his instrument high into the treble clef; and to even things up the other members of the ensemble are given similar material. The result at times is rather like a sinfonia concertante without orchestra; or, more precisely, like the type of quatuor concertant that was popular in France, and had been popularised by Boccherini (who worked mainly in Spain, but whose chamber music was mostly published in Paris). Boccherini’s Opus 24 quartets of 1777 also have brilliant cello parts, and may be the immediate models of Mozart’s ‘Prussian’ quartets. It may be that Mozart failed to complete the Prussian quartets not just because he was pressed for money. Many writers have noticed echoes of Figaro and Così fan tutte in them (Così was written and produced while he was struggling with them), and Mozart may eventually have found that the brilliant, concertante writing he gave to all four stringed instruments was more naturally deployed in opera or the concerto. We may feel that Mozart’s instinct was correct, for in the subsequent history of the classical string quartet the quatuor concertant turned out to be a blind alley, shunned by the great composers. But the ‘Prussian’ quartets certainly contain a wealth of wonderful music, and their troubled genesis gives them a special place in Mozart’s works. Mozart a acquis la réputation que, seul de tous les grands compositeurs, il pouvait composer facilement et rapidement sans l’aide d’ébauches. Il est vrai que nous avons des exemples d’une facilité étonnante: on dit qu’il écrivit l’ouverture de Don Giovanni en une seule nuit et La Clemenza di Tito en dix-huit jours. Mais les quatuors à cordes raffinés de Mozart lui ont certainement demandé beaucoup d’efforts. Les six quatuors, qu’il publia en 1785, dans l’Opus 10, l’occupèrent pendant presque trois ans; et dans sa dédicace à Joseph Haydn, il écrivit qu’ils étaient le fruit d’un «long et très laborieux effort». Ce n’était pas une exagération, car un nombre anormal d’ébauches et de révisions de ces œuvres ont survécu: Mozart avait manifestement des difficultés à s’habituer au style perfectionné du quatuor à cordes de Haydn, et la plus récente preuve en est fournie par les quatuors de l’Opus 33 de 1781. Les six quatuors dédiés à Haydn forment la dernière collection complète de quatuors composés par Mozart, mais il ne se désintéressa pas du genre. Et il est évident que celui-ci continua à lui donner des difficultés. Le quatuor suivant fut celui en ré majeur que nous connaissons sous le nom de «Hoffmeister», K499, ainsi nommé parce qu’il fut publié en 1786 à Vienne par l’éditeur Franz Anton Hoffmeister (1754–1812). Hoffmeister était également un compositeur et avait fondé une maison d’édition pour imprimer sa propre musique; il élargit bientôt les activités de son affaire pour publier des œuvres orchestrales et collections de musique de chambre de ses contemporains, parmi lesquels Haydn, Vanhal, Albrechtsberger et Mozart. Mozart et Hoffmeister étaient amis et aussi francs-maçons. Leurs relations commencèrent en automne 1785, quand Hoffmeister publia le quatuor pour piano en sol mineur de Mozart, K478; et celui-ci basa l’un des mouvements de son quatuor pour flûte en la majeur, K298, écrit entre 1786 et 1787, sur une mélodie de Hoffmeister. Une annonce pour le quatuor «Hoffmeister» a survécu, dans laquelle l’éditeur s’exprime ainsi: «Ce morceau a été écrit avec cette flamme imaginative et cette justesse qui ont, depuis longtemps, gagné à Herr M. la réputation d’être l’un des meilleurs compositeurs d’Allemagne.» Il ajoutait que même le menuet était «composé avec une ingéniosité (entrelacé comme il l’est avec des imitations canoniques) que l’on cherchait souvent en vain dans d’autres compositions du même genre». L’ingéniosité qui séduisait Hoffmeister était l’habileté—dont Haydn avait donné la plus grande preuve dans son Opus 33—de combiner les deux idiomes du quatuor à cordes contemporain: la qualité de légèreté, ressemblant à un divertissement, des premiers morceaux de Mozart dans ce genre, par exemple, et la tradition contrapuntique sérieuse du quatuor viennois habituel, dont les œuvres par Monn, Albrechtsberger et Gassmann sont d’excellents exemples. Dans ce nouveau style de quatuor, les mélodies sont soutenues non seulement par l’harmonie, mais aussi par des motifs qui l’accompagnent et qui ont leur propre rôle à jouer dans l’argument musical; c’est une conversation civilisée entre égaux, plutôt qu’un monologue ou une dispute entre quatre personnes. On trouve la même qualité, bien que sous une forme plus détendue, dans les trois quatuors «Prussiens», K575 en ré, K589 en si bémol, et K590 en fa, qui sont les dernières œuvres de Mozart dans ce genre. Ils furent composés en 1789–90, résultat d’une commande par le roi de Prusse, Frédéric II, que le compositeur obtint lors d’une visite en Allemagne du Nord au printemps de l’année 1789. Mozart avait clairement l’intention d’écrire une collection de six quatuors, et espérait qu’ils seraient la solution à ses problèmes financiers, mais en mai 1790, il se plaignait que les soucis au sujet de ses dettes l’avaient empêché de les terminer; et dans une lettre à son créancier Michael Puchberg, le mois suivant, il admettait avoir «été obligé de faire cadeau de mes quatuors (ce labeur exténuant) pour une bouchée de pain, tout simplement pour avoir de l’argent pour faire face à mes difficultés actuelles». L’édition de ces trois quatuors complets qu’Artaria publia peu après la mort de Mozart, ne fait aucune référence au roi de Prusse ni à sa commande. On a longtemps pensé que Mozart, dans son impatience de commencer à écrire ces quatuors, utilisa comme base de certaines parties de ces morceaux, des ébauches d’œuvres inachevées, datant du début des années 1770, lorsqu’il voyageait en Italie et commençait à écrire des quatuors. Cet argument a maintenant été réfuté, mais de nombreux critiques ont remarqué que les trois morceaux ont un caractère calme et charmant qui semble revenir aux premiers quatuors italiens de Mozart. L’ambiance que crée son utilisation répétée du tempo Allegretto, est certes bien loin de la gravité concise de la collection dédiée à Haydn. L’explication semble se trouver dans les termes spéciaux de la commande de Frédéric-Guillaume. Le roi de Prusse était un amateur passionné de violoncelle et collectionnait la musique de chambre dans laquelle le violoncelle jouait un rôle proéminent. En 1786, l’année de son accession au trône, Pleyel lui fournit des quatuors comme il les aimait, et il engagea Boccherini—qui avait développé le quintette à cordes avec deux violoncelles—comme son compositeur de musique de chambre. L’année suivante, Frédéric-Guillaume commanda une collection de quatuors à Haydn, son Opus 50. Haydn, comme nous pouvons nous y attendre, ne répondit pas simplement en donnant au violoncelle des passages ressemblant à des concertos, car cela aurait relâché inévitablement la concentration de son architecture musicale si dépouillée. Au lieu de cela, il introduisit le violoncelle dans l’argument musical en se servant de la sorte d’écriture à motif, à demi-contrapuntique qu’il venait de développer pour ses «Sept Dernières Paroles»; il en écrivit la version en quatuor environ à l’époque où il commençait l’Opus 50. Cependant, en 1789, Mozart avait assimilé tout ce dont il avait besoin du style de quatuor de Haydn, et se trouvait prêt à prendre une autre direction. Il satisfit les souhaits du violoncelliste royal en lui donnant de longs solos où son instrument monte dans les notes supérieures de la clef de sol, et pour équilibrer le tout, donne aux autres membres de l’ensemble une musique similaire. Par moments, le résultat ressemble plutôt à une «sinfonia concertante» sans orchestre; ou, plus précisément, comme une sorte de «quatuor concertant» qui était à la mode en France, et que Boccherini avait rendu populaire (il travaillait surtout en Espagne, mais sa musique de chambre était pour la plus grande partie publiée à Paris). Les quatuors de l’Opus 24 de Boccherini, composés en 1777, ont aussi de brillantes parties de violoncelle, et sont peut-être les modèles immédiats des quatuors «Prussiens» de Mozart. Il est possible que Mozart n’ait pas réussi à terminer les quatuors ‘Prussiens’ pour une autre raison que celle d’avoir besoin d’argent. De nombreux écrivains ont remarqué dans ces quatuors des échos de Figaro et de Così fan tutte (Così fut écrit et produit pendant qu’il se débattait pour les écrire) et il est possible que Mozart ait fini par trouver que l’écriture brillante et concertante qu’il donnait aux quatre instruments à cordes serait plus naturellement déployée dans l’opéra ou dans le concerto. Nous pouvons penser que l’instinct de Mozart était correct car, dans l’histoire du quatuor à cordes classique telle que nous la connaissons de nos jours, le «quatuor concertant» apparaît comme une impasse, évité par les grands compositeurs. Mais il n’en demeure pas moins que les quatuors «Prussiens» contiennent une abondance de merveilleuse musique, et leur création difficile leur assure une place toute spéciale dans les œuvres de Mozart. Häufig wird der Eindruck erweckt, Mozart sei als einziger unter den großen klassischen Komponisten in der Lage gewesen, leicht und schnell und ohne die Hilfe von Entwürfen zu komponieren. Es trifft zu, daß uns Beispiele erstaunlicher Flüssigkeit vorliegen: Er soll die Ouvertüre zu Don Giovanni in einer einzigen Nacht verfaßt haben, und die ganze Oper La Clemenza di Tito binnen 18 Tagen. Dagegen machten ihm die sechs Quartette, die er 1785 als Op. 10 veröffentlichte, mit Unterbrechungen fast drei Jahre lang zu schaffen, und in der Widmung an Joseph Haydn schrieb er, sie seien die Früchte langer, mühevoller Arbeit. Das war keine Übertreibung, denn von diesen Quartetten ist eine ungewöhnliche Zahl von Entwürfen und Bearbeitungen erhalten; Mozart fand es offenbar schwierig, mit Haydns ausgereiften Quartettstil fertigzuwerden, wie er kurz zuvor durch dessen Quartette Op. 33 von 1781 veranschaulicht worden war. Zwar vollendete Mozart im Anschluß an die sechs, die er Haydn gewidmet hatte, keine weitere Serie von Quartetten, doch vernachlässigte er das Medium nicht ganz. Und es existieren Beweise dafür, daß es ihm weiterhin Probleme bereitete. Sein nächstes Quartett war das Einzelwerk in D-Dur, das unter der Bezeichnung „Hoffmeister“-Quartett KV499 bekannt ist und so benannt wurde, weil es 1786 in Wien von dem Verleger Franz Anton Hoffmeister (1754–1812) herausgegeben wurde. Hoffmeister betätigte sich auch als Komponist und hatte zwei Jahre zuvor ein Verlagsunternehmen gegründet, um seine eigene Musik zu drucken; bald darauf dehnte er das Geschäft auf Orchester- und Kammermusikwerke seiner Zeitgenossen aus, darunter Haydn, Vanhal, Albrechtsberger und Mozart. Mozart und Hoffmeister waren Freunde und Freimaurerkollegen. Ihre Geschäftsbeziehungen begannen offensichtlich im Herbst 1785, als Hoffmeister Mozarts Klavierquartett in g-Moll KV478 veröffentlichte; und Mozart baute einen Satz seines Flötenquartetts in A-Dur KV298, das ungefähr 1786-87 entstand, auf ein Lied von Hoffmeister auf. Uns ist eine Anzeige für das „Hoffmeister“-Quartett überliefert, in der der Verleger schreibt, es sei mit jener feurigen Fantasie und Korrektheit abgefaßt, die dem Herrn M. längst den Ruf eines der besten Komponisten in Deutschland eingetragen habe. Er fügt hinzu, daß selbst das Menuett (was die Einflechtung kanonischer Imitation angeht) mit einem Geschick gestaltet sei, das andere Kompositionen dieser Art nicht selten vermissen ließen. Das „Geschick“, auf das Hoffmeister ansprach, war die Fähigkeit, die in hohem Maße von Haydns Op. 33 demonstriert wird, nämlich beide Idiome des zeitgenössischen Streichquartetts zu verbinden: die leichte, am Divertimento orientierte Beschaffenheit von, sagen wir, Mozarts eigenen frühen Quartetten und die ernsthafte kontrapunktische Tradition der Hauptströmung des Wiener Quartetts, wie sie in Werken von Monn, Albrechtsberger und Gaßmann zum Vorschein kommt. Beim neuen Quartettstil wurden die Melodien nicht nur harmonisch gestärkt, sondern auch durch begleitende Motive, die in der musikalischen Erörterung ihre eigene Rolle zu spielen haben; dies führt zu einer zivilisierten Auseinandersetzung zwischen Ebenbürtigen, anstatt zum Monolog oder allseitigen Disput. Die gleiche Eigenheit findet sich, wenn auch in entspannterer Form, in den drei „Preußischen“ Quartetten KV575 in D-Dur, KV589 in B-Dur und KV590 in F-Dur, Mozarts letzten Werken dieser Gattung. Sie entstanden 1789-90 und waren Resultate eines Auftrags des Preußenkönigs Friedrich Wilhelm II., den Mozart bei seiner Reise ins nördliche Deutschland im Frühjahr 1789 erhalten hatte. Offenbar hatte Mozart an eine Folge von sechs Quartetten gedacht und gehofft, daß sie seine Finanzprobleme lösen würden, doch klagte er im Mai 1790, die Sorge um seine Schulden habe ihn davon abgehalten, sie zu vollenden. In einem Brief an seinen Gläubiger Michael Puchberg gestand er einen Monat später, er sei nun gezwungen gewesen, seine (mühevoll verfaßten) Quartette für wenig Geld abzugeben, nur um etwas Bargeld in die Hand zu bekommen und damit seinen akuten Problemen zu begegnen. In der Druckausgabe der drei vollendeten Quartette, die kurz nach Mozarts Tod von Artaria herausgegeben wurde, fehlt jeglicher Hinweis auf den preußischen König und dessen Kompositionsauftrag. In der Vergangenheit wurde angenommen, Mozart habe, daß er begierig war, die Arbeit an den Quartetten aufzunehmen, Teile davon auf Entwürfen zu unvollendeten Werken aus der Zeit um 1770 aufgebaut, jenem Zeitraum, auf den seine Italienreisen und ersten Quartette entfielen. Dieses Argument wurde inzwischen widerlegt, doch ist zahlreichen Kritikern aufgefallen, daß die drei Werke einen lässig charmanten Charakter besitzen, der auf Mozarts frühe italienische Quartette zurückzugehen scheint; die Stimmung, die durch wiederholten Einsatz des Tempos Allegretto aufkommt, ist jedenfalls weit entfernt von der prägnanten Ernsthaftigkeit der Haydn gewidmeten Quartette. Die Erklärung hierfür scheint in den besonderen Bedingungen des von Friedrich Wilhelm erteilten Auftrags zu liegen. Der preußische König war ein eifriger Amateurcellist und sammelte Kammermusik mit markanten Celloparts. 1786, also im Jahr seiner Thronbesteigung, erwarb er Quartette dieser Art von Pleyel und ernannte Boccherini—den Erfinder des Streichquintetts mit zwei Celli—zu seinem Kammerkomponisten. Im nächsten Jahr ließ Friedrich Wilhelm sich von Haydn eine Serie von Quartetten komponieren, dessen Op. 50. Wie zu erwarten, begnügte sich Haydn nicht damit, dem Cello schlicht konzertante Passagen zuzugestehen, denn das hätte seine sparsame, konzentrierte musikalische Architektur verhängnisvoll aufgelockert. Stattdessen bezog er das Cello in die musikalische Auseinandersetzung ein, indem er sich der motivischen, semikontrapunktischen Kompositionsweise bediente, die er soeben für „Die sieben Worte des Erlösers am Kreuz“ entwickelt hatte; die Quartettversion hiervon fertigte er etwa um die Zeit, als er sein Op. 50 in Angriff nahm. Mozart dagegen hatte 1789 von Haydns Quartettstil übernommen, was er brauchte, und war soweit, eine neue Richtung einzuschlagen. Er schmeichelt dem königlichen Cellisten mit ausführlichen Soli, die sein Instrument weit hinauf in den Bereich des Diskantschlüssels vordringen lassen; und die übrigen Mitglieder des Ensembles erhalten zum Ausgleich ähnlich anspruchsvolles Spielmaterial. Das Ergebnis gleicht stellenweise einer konzertanten Sinfonie ohne Orchester oder vielmehr dem Typ des damals in Frankreich populären Quatuor concertant, das von Boccherini (der hauptsächlich in Spanien arbeitete, dessen Kammermusik jedoch meist in Paris veröffentlicht wurde) eingeführt worden war. Boccherinis Quartette Op. 24 von 1777 weisen ebenfalls brillante Celloparts auf und mögen Mozarts „Preußischen“ Quartetten als unmittelbare Vorbilder gedient haben. Möglicherweise lag es nicht nur am Geldmangel, daß Mozart die Preußischen Quartette nicht vollenden konnte. Viele Autoren haben in ihnen Anklänge an Figaro und Così fan tutte ausgemacht (Così wurde geschrieben und produziert, während er sich damit abmühte), und Mozart könnte irgendwann festgestellt haben, daß sich die glanzvolle konzertante Kompositionsweise, die er allen vier Streichinstrumenten zukommen ließ, in Oper oder Konzert natürlicher anwenden ließ. Man könnte die Ansicht vertreten, daß Mozart instinktiv richtig lag, denn im weiteren Verlauf der Geschichte des klassischen Streichquartetts erwies sich das Quatuor concertant als Sackgasse und wurde von den bedeutenden Komponisten gemieden. Dennoch enthalten die „Preußischen“ Quartette eine Fülle wunderbarer Musik, und es gebührt ihnen wegen ihrer problematischen Entstehung ein Sonderplatz in Mozarts Gesamtwerk.